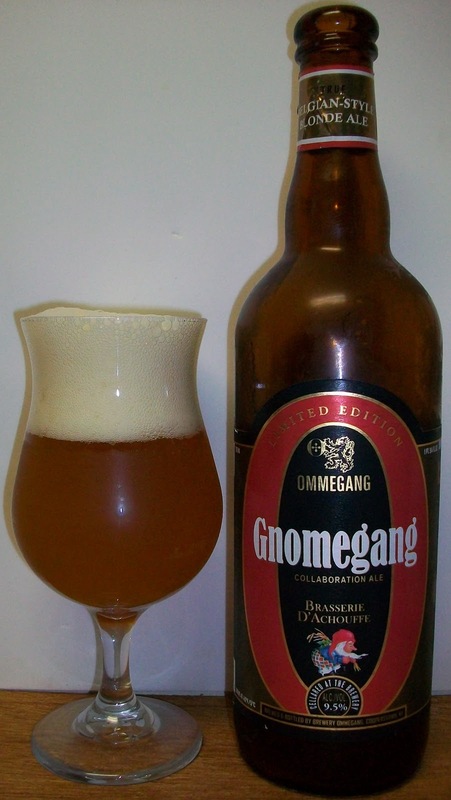 I was just shopping at State Line Liquors for something different and I noticed some new labels from Ommegang. This collaboration caught my eye since I’m a huge fan of d’Achouffe. The beer pours a hazy golden straw color with a bright white head. The nose is nice with light malt aromas, floral hops and citrus notes. That was a nice first sip; light malt sweetness with some fruity notes and a very warming finish. The taste starts out with a light malt sweetness up front on the ht tip of the tongue. That is followed by a cleansing effervescence over the tongue in the middle of the sip. The back end is very easy drinking for a 9 plus percent alcohol ale. There is also a carbonation release during the swallow that adds a refreshing quality to the experience and also masks some of the flavors at this point. The finish is impressive with sweet light malts with spice and citrus notes along with the most noticeable hoppy presence all on a bed of yeasty goodness. The hops are very pronounced but at no point are they overpowering or for that matter bitter but they do provide a nice bite to this sharp finish. The hop sharpness dissipates fairly quickly and leaves that classic sweet malt yeasty Belgian aftertaste. All and I’m really liking this beer. As this beer warms and opens up it is much smooth with more noticeable flavors. At first I could only since the warming effect of the alcohol now that we have warmed up a little you can really taste the sweetness from it. Although it is still pretty well masked; you would not suspect 9.5 ABV more like 7 if that. This is a pretty impressive ale. There is an interesting light malt coating that is left throughout the mouth; similar to that of a stout but with lighter and sweeter malts. The warmer this beer gets the sweeter and more delicious it gets. We are now at 66 degrees and this beer is opening up nicely. This may be my favorite offering from Ommegang. I am savoring this for all it’s worth. This is smooth with an almost velvety mouthfeel and finish. Even the powerful bite seems to have been taken over by the richness and the alcohol. O Man, what a nice beer. The complexity of this beer is remarkable. At first this was like a Belgian IPA with a warming finish. Then it turned into an easy drinking Belgian Strong Pale as it warmed up a little. Now it is exquisitely smooth and sweet like a beer liqueur. This is hands down an A+. This was an amazing experience. The complexity really gave me three different beer experiences all in one bottle.